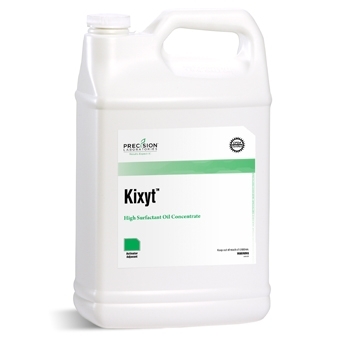 Kixyt is a low use rate, high surfactant load, methylated seed oil concentrate that enhances crop protection performance when compared to ordinary methylated seed oils or crop oil concentrates. Kixyt combines the cuticle penetration properties of a premium quality methylated canola oil with a proprietary surfactant system to deliver higher levels of biological performance at lower use rates than traditional oil-based adjuvants. Kixyt can be used at 1/2 the rate of crop oil concentrates.